I have a plant growing in my small garden - it was left from last year thinking it was a self-seeded Mullein but is not. blue individual small flowers single on branching stems from basal growth of leaves around. Seemed to start out furry but they are not. Attached two photos getting desperate as all neighbours' now on hunt for its name. 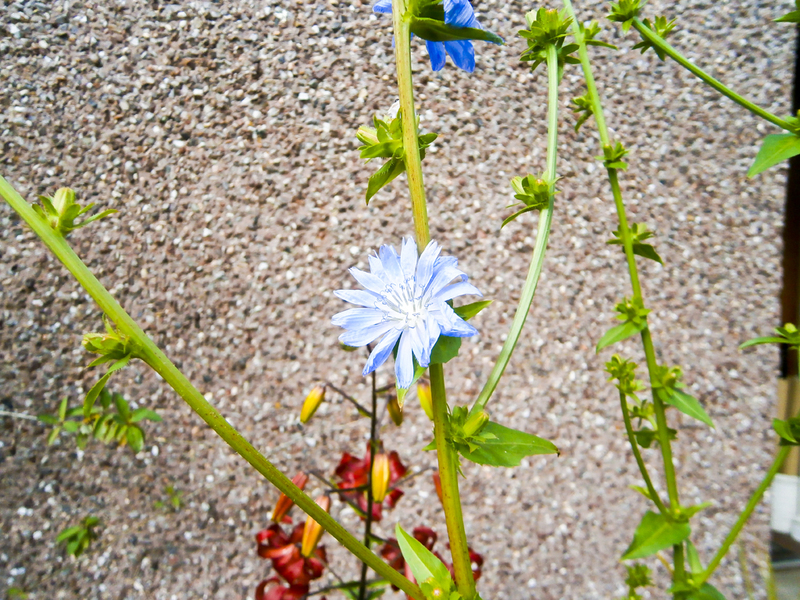 I'm not a flower expert but it looks like the flower of Common Chicory (Cichorium intybus). I've seen something similar growing wild all over Europe. I might be wrong of course. It's a new one to me but it seems that you are correct in your ID TJ, also known as Succory, have just been looking it up in my wild flowers Bible! Very pretty colour (can also be yellow & easily confused with Dandelion & the like) ... Visited by Bees & Hovers! I also agree this is what it is.